In 1813, printer Robert Harrild (1780-1853) joined the debated raging inside the London printing community as to the use of rollers rather than balls to ink a printing plate. The majority of hand-printers preferred inking balls but Harrild’s demonstration of his new roller was so successful that rollers became compulsory in every print shop throughout the city. Harrild established a company, located at 25 Farringdon Street, to manufacture the rollers and eventually all kinds of printing equipment. 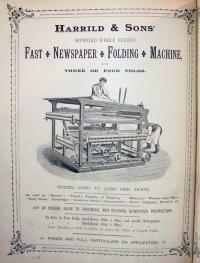 His advertisements boasted: “Harrild and Sons’ Manufacture … have on sale every article connected with printing machinery; type, presses, machines…” Shortly before his death, Harrild’s rollers and Paragon platen press were exhibited in the Crystal Palace during the Great Exposition of 1851. His sons continued to run the company well into the twentieth century. 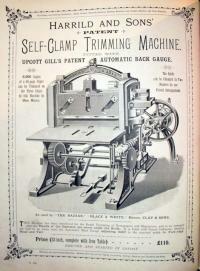 Graphic Arts recently acquired two of their equipment catalogues: Catalogue of Printing Machinery and Materials with Selected Type Specimens, ca. 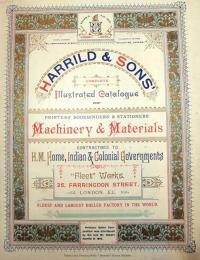 1895, and Harrild & Sons’ Complete Illustrated Catalogue of Printers, Bookbinders’ & Stationers’ Machinery & Materials, 1892. Note in particular the machine to fold newspapers. Hi Julie, I found your article most informative. I have a very large collection of wooden printers type and have been investigating the origins of many of the pieces. I recently discovered two upper case P's in my collection that were clearly stamped on the reverse HARRILD LONDON. This discovery lead me to Google,which led me to your article. Thankyou. Julie - Thanks for finding and posting this information. Now I know just when printers switched from balls to rollers - and can tell my students. 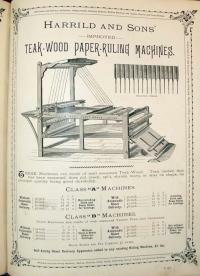 Does this catalog show his roller system for platen presses? 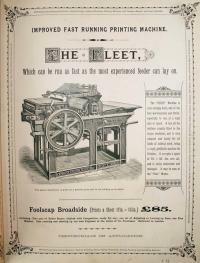 Please come visit our collection of job presses & type & casters if you'd like. We're in Frenchtown, NJ - less than an hour from Princeton. Hi all, I have an original Harrild and Sons catalogue, cannot find a date on it but in the roller casting section it has the dates 1809=1911, the address on every page is NORWICH STREET,LONDON, E.C., bit of a weird coincidence as I live in Norwich, Norfolk, U.K. it is a bit dogeared and some sections have come away and really is in need of being rebound but it has no covers, anyway it is quite a substantial catalogue with all printers and bookbinders equipment illustrated with the then price including the albion and columbian pressess, the crown was £38.00 demy £48.00 and super royal £60,there are prices for all kinds of equipment even the type high gunmetal guage and the composing stick which I own, I started printing at school in 1960 and been a printer since, doing all kinds of printing, up to litho but now I am back on Heidelberg Platen where I started, gone full circle nearly as I started as a compositor in 1963, but I still stand in on the litho machines and guillotine when holidays come around, they reckon letterpress is dead, dont you beleive it this platen is going flat out 5 days a week, anyway must go now, regards John.